Very English in atmosphere, very vocal, passionate crowd. Okay so they're better looking than those in the average Brit pub. Damn their genes. Also the biggest screen so far, it covered the whole of one wall. 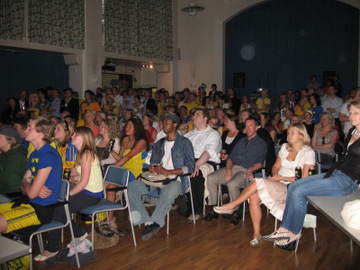 You can also watch England vs Sweden with live musical accompaniment at the Vortex in Dalston. www.vortexjazz.co.uk. I have put some photos up of the England vs Paraguay game.